Busking -- playing or improvising in the streets and other public places -- is a fascinating and beautiful tradition that dates back to antiquity. So, it was only fitting that I got my own introduction to this art form on the breathtaking streets of Florence. My guide to busking was Wendy Yates, originally from Denver and Fort Collins, Colorado. Despite an early childhood in extreme poverty before her family found better circumstances in Fort Collins, she earned a doctorate at Eastman, the top music school, in performance and literature with a speciality in the viola. Giving money, she pointed out, is a very personal act. People have to be very motivated, as every dollar, every coin, counts. I am so grateful that Wendy shared her insights on entrepreneurship and music with me. SM: Wendy, tell us about why you play the viola. WY: The viola is an instrument I have always loved, and it is one of the most important string instruments in the orchestra. It is the middle sibling of the string section. It is the center of sound and the hardest voice to hear. Perhaps it is also the most important voice because if you can hear it, then you can discern all of the sounds in the orchestra. With the same strings as the cello while being an octave higher, it has its own unique, sultry voice. It has been played by some of the most famous composers -- Bach, Mozart, Beethoven, Haydn, Schubert, Mendelssohn, Britten, Dvorak and Hindemith, they all played it because of its beautiful sound. SM: Tell us about how you got to Florence. WY: When I was in undergrad at the University of Northern Colorado, I was a leading viola player in our orchestra. One day, I looked over my shoulder, and there was one of the most handsome men I had ever seen playing the trumpet. He was Italian, fun, and had traveled all the way from Florence to study with the legendary teacher Bill Pfund. The minute I met this man, Pietro, I knew we had a special bond and I remember thinking, 'This is a man I could marry.' I arranged for us to sit together, moving the violas so that first trumpet and first viola could be side by side! We fell madly in love -- music and mutual attraction brought us together with a great passion. When he had to return to Florence after we both earned our doctorate degrees, I was in love and moved with him. Our relationship produced two wonderful children -- now ages six and eight. Now, I love Florence but it was not always easy. I knew from the beginning that I would love it but there was a painful side as well. I found it difficult to adjust and get work. I think that it is particularly difficult for women. SM: How did you integrate into Florence? WY: I finally integrated by giving back to the community. 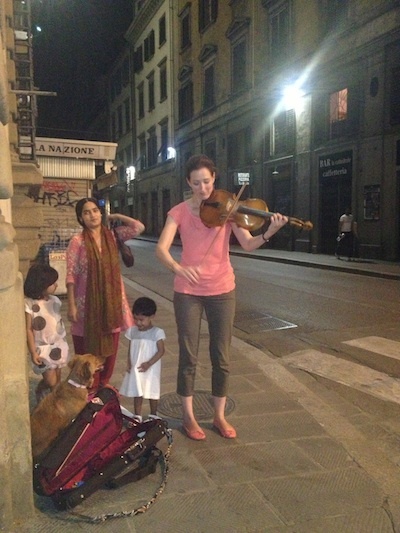 I began to give free violin lessons to the local children. I became the violin lady instead of the American mother. The violin became my introduction to the children and their mothers, so we all became friends. Soon the international school here hired me as their violin teacher and their volleyball coach. Back in high school I had to make a choice between volleyball and music. I feel that my life has come full circle and now I am able to do three loves -- entrepreneurship with my small business, volleyball with coaching, and music with my teaching. SM: Tell our readers about playing in the streets of Florence. WY: I first started to play when I was in Rochester, in the airport. Someone dared me to play for money so I opened my case and began to play my viola. Money rained into the case. I was 25 and without realizing it, I had started my own business. In ten minutes, I earned $20 without even asking. One thing I've noticed is that each person handles their money in their own special way: some wad it, some hand it carefully; and one time a woman folded a 50-euro bill with a note that read "I am a dreamer too." Another time a young woman came to me, thinking I was Italian and said: "I just want to thank you as I just made the best love with my husband because of your music." I glanced up and waved to the happy young husband. So, after a long interview, I asked, "Could I see you do street performing? Could you show me how its done?" 1. It has to be away from windows, so she doesn't disturb people. 2. There has to be a lot of foot traffic but no car traffic. 3. There has to be minimal noise, so that her own sound carries -- people are more likely to approach her if they hear her music before seeing her. 4. Always play after dinner, not before, so people are not thinking about eating and feeling hungry. 5. Never compete. If there are other musicians, actors, performers present, you must find another location. 6. Always look your best with strong posture. People want to support someone with a professional appearance. 7. Take the art seriously. When she plays, she is giving a concert. It is about playing her music and connecting with other human beings. It is not about the monetary gain, which enables her to create great art. Wendy Yates is a great street musician and a successful entrepreneur. Her lessons should be heeded by aspiring performers everywhere. I know I will see her again, and I wish her all of the luck in the world.